Deceleration of a holiday on 10.4.2014 (Thursday) on account of Elections in Delhi and on Monday the 14.4.2014 on account of the birth anniversary of Dr.Ambedkar, provided the perfect opportunity to visit Tirthan Valley in Himachal Pradesh for birding with my family. 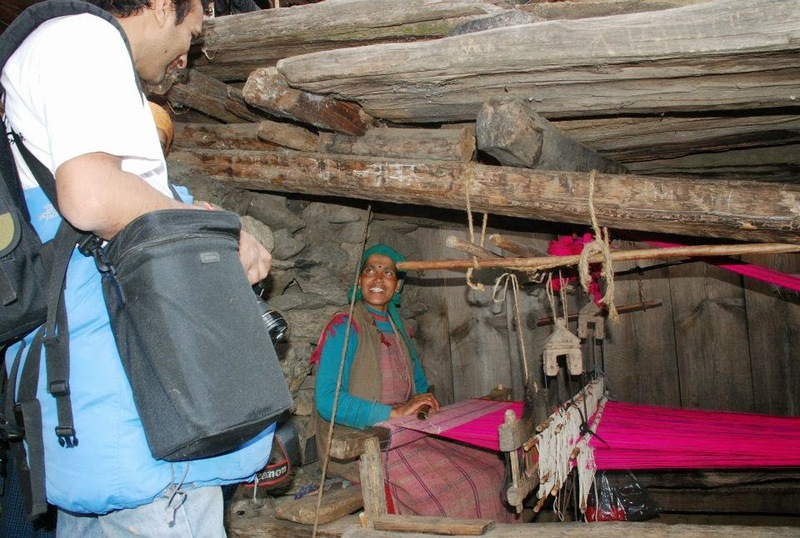 We have been visiting tirthan for birding at least once a year since 2010.There are a number of reasons for it. The foremost being the abundance of Asian Paradise Flycatchers, Red-headed Bullfinches, Crested King fishers, in such a small area during the moths of April to June. The second reason is the fact that it is not a regular tourist destination even for birders. The overcrowding that one associate with Sattal and Pangot is thankfully absent in Tirthan. Location: Situated at a height of around 1600 meters in the District Kullu, Tirthan valley is the gateway for the Great Himalayan National Park (GHNP) which is also famous for the Western Tragopan. Tirthan river flowing through the valley is a paradise for anglers for trout fishing. 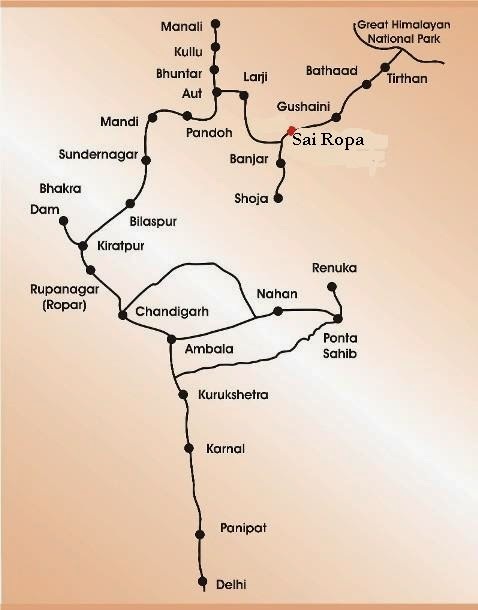 How to reach: A one-night journey by bus from Delhi. Himachal Pradesh Tourism Development Corporation (HPDC) AC Volvo buses (Rs.1200/ one way) is the best option (for those who do not want to drive or hire a taxi all the way). [Do not take the Himachal Road Transport Volvos or private services as they stop for the dinner as well as the early morning halt at shanty dhabas]. The HPTDC bus departs from Mandi House, Delhi at 6.30 P.M and reaches Aut at around 5.30 AM. One can get down at Aut (before entering the tunnel) and then take a taxi to Tirthan valley.It takes about 1 hour to reach Tirthan Valley (Nagini) from Aut. On the way back, one can take the same Volvo from Aut at around 6.30 PM and reach Delhi at 6 A.M. For those unable to take a day off from office, the whole thing can be done on any weekend although pre-fixing at least one holiday with the weekend is the ideal duration. I contacted Mr.Panki Sood (Mobile-09418204666 and 09817700040) of the Sunshine Himalayan Adventures to take care of the transport from Aut and also my stay in Tirthan. 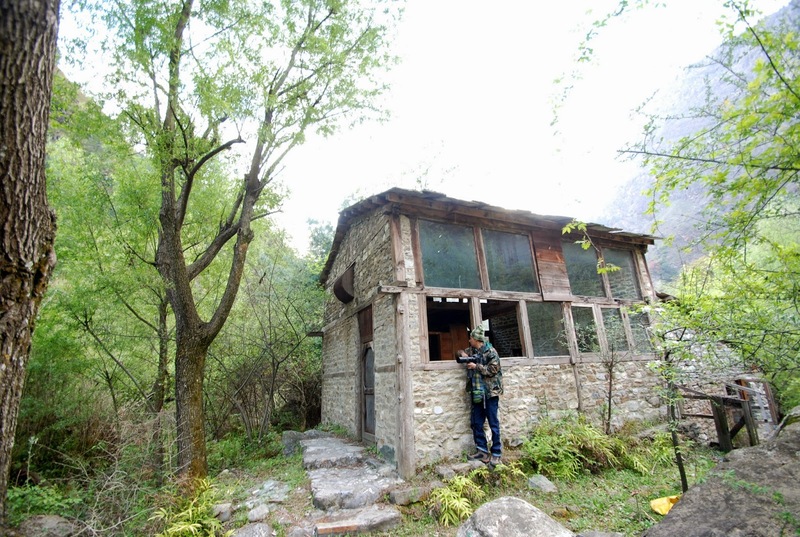 Mr.Sood is a great help in case you want to shoot cheer pheasants in Nadar and also making arrangements for entry passes and the trek and stay in the Great Himalayan National Park for those who want to see the Western Tragopan. He knows the valley as the back of his hand particularly the birding spots and was also associated with the Princeton University's recent project in GHNP. 10th April, 2014: We reached Aut at 6 AM on 10th Morn and were received by Mr.Sood personally. We reached Tirthan by 8.30 AM. On the way, we had to stop a number of times to click. Crested King Fishers sitting on the cables crossing the river is a common sight in the morning. We also stopped at all the bridges to check underneath them for sighting the spotted-forktail which are frequented by the forktails. We stayed at Hotel Trout Valley at Nagini which is one of the best option. 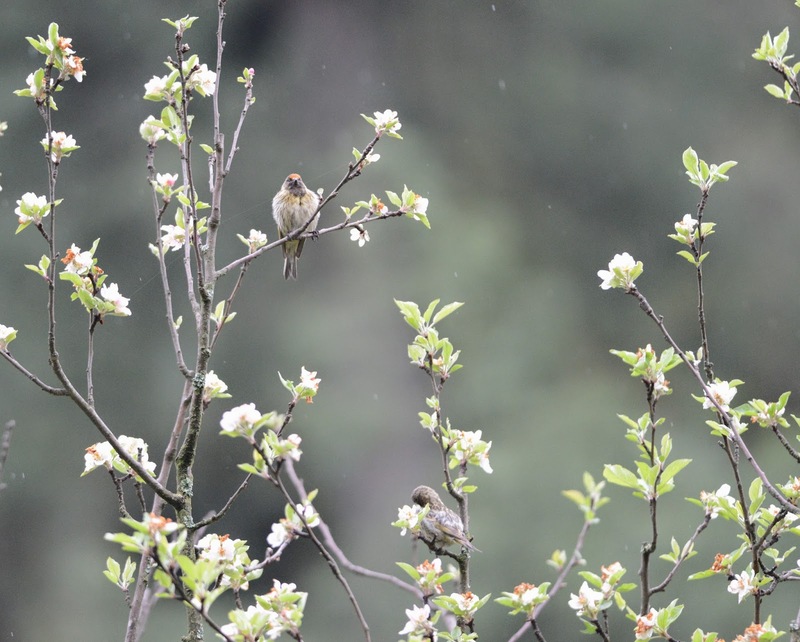 On reaching Nagini no sooner had we settled down the chirping of a known species made us immediately rush out to the orchards behind the homestay, to look for the red-headed bull finch which I have never failed to find there in all my previous visits. As expected I found a few foraging on the ground and was overjoyed to click a few of them. Within a few minutes I had the finch and some decent shots of Ultramarine in my kitty. 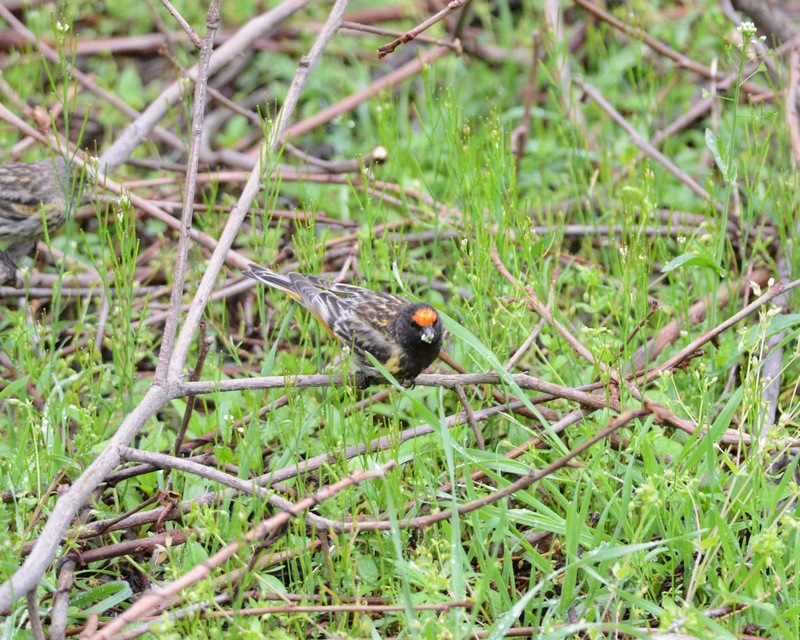 The orchards are also the favorite haunt for fire-fronted serin. Facing the orchard is the dining room the homestay and one can sit there all day watching various species from the window. Birding can not be easier than this. After finishing the breakfast, Mr.Sood suggested that we should trek to the Waterfall. The waterfall in Tirthan is very beautiful and takes about half-an-hour of easy trek to reach and it is a very good spot to get the little forktail from very near. Although I could not get the little forktail this time but Mr.Sood informed that downstream there are few breeding pairs of plumbeous water red-start and it would be interesting to document their feeding sessions. We found three chicks perched on a big boulder in the mid-stream waiting for their parents to bring them food. In the intervals between their feeding sessions (which was never more than 10 minutes) the eldest of the chicks would make sallies in the air to catch flies, unsuccessfully most of the time though. Every time one of the chick made a sally, both of us waited with bated breath for the results. Here we also got a glimpse of the little forktail but did not get to shoot it. In the evening, after Mr.Sood obtained the permits for fishing from the fisheries department, we tried our hand at angling, which was real fun. Yes! I managed to catch one small trout after an hour's effort. 11th April 2014: It was raining all night. At 6.30 AM their was a very brief halt and I went out to try my luck. In the orchards that you see on the right in the photograph below, I could see a number of russet sparrows(at least 10-15 in two trees and totaling at least 50). It was overcast yet so many together was a lovely site. I approached one group but to my surprise these birds looked little different. As I came within 15 feet I realised that they were fire-fronted serins. In my excitement I almost rushed towards them and committed the cardinal mistake. All of them flew away and went to the trees at the far end of the valley near the village. Finally I reached the village and got few decent shots despite the overcast conditions. It was a very clear sky. Mr.Sood had earlier told me of a particular area where few Kaleej Pheasants were being regularly seen by the villagers. Therefore, early in the morning, I went to the spot. It was not difficult to find one waiting on the edge of a road for his females to come up. Mr.Sood has a very beautiful loghut on the right bank of Tirthan river which is surrounded by bushes and trees of all kinds. 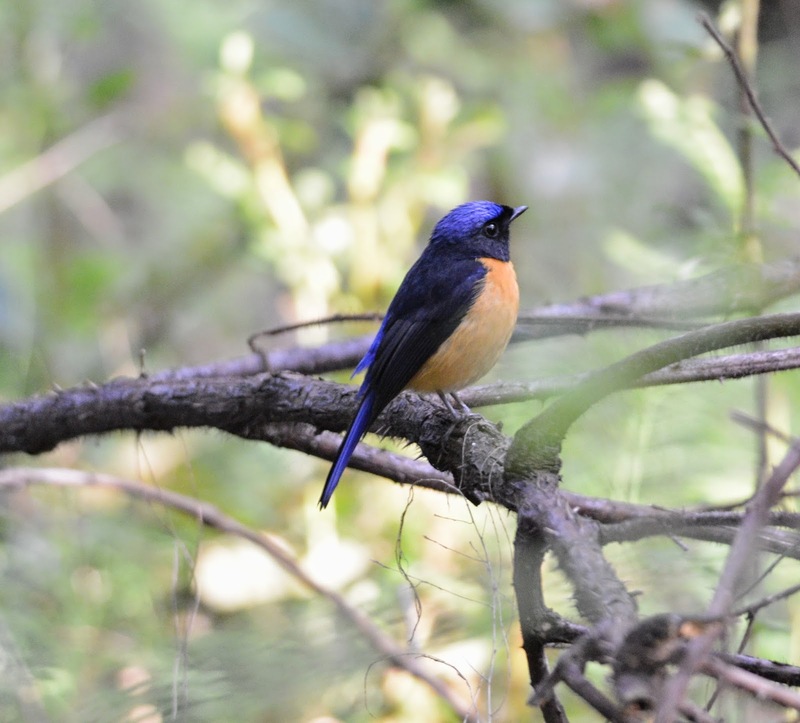 It is a hot spot for birders as the Rufous Bellied Niltava (named बढ़ा नीलू by Mr.Sood), APFC and many other species are resident in this areas. All a birder has to do is to sit tight near a window of the house and shoot birds as and when they visit near the bushes which they do at regular intervals. On being asked as to why RBN is named as बढ़ा नीलू, Mr.Sood informed that the small niltava ( छोटा नीलू) is also a visitor near the bush. I was a little surprised on being told of Small niltava because as per Mr. Inskipp's book which is my reference book, small- niltava is not shown in Himachal. I was proved wrong as within half-an-hour, both the neelu's arrived. I have never ever taken a shot at these two species from so near not even in Sattal, where they normally come to drink at the spot well known to all birders. Mr.Sood, however informed me after seeing the pictures that I was lucky to get them in such a short time. 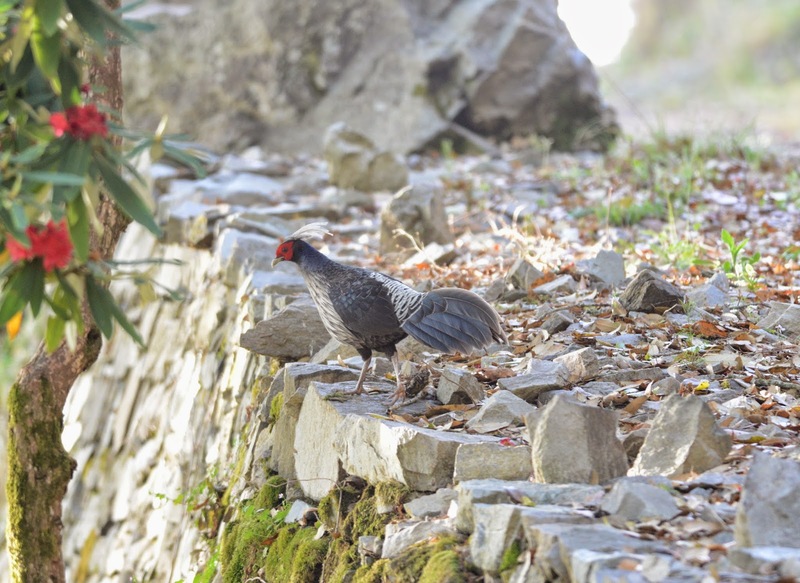 13th April: Tirthan is also a place to get Cheer Pheasant. There is a place called Nadar where they are reportedly easily sighted. Mr.Sood's friend has a house there and he had earlier guaranteed a sighting if we could come early in the morning. The prospect of shooting a cheer was too enticing to be ignored. Therefore, Mr.Sood, my wife, daughter and I started the trek for Nadar at around 8 AM.After covering half the distance, I decided to abandon the trek because of a particular bend after the village Nadar which appeared a little risky to me for my little daughter who, however, was audaciously making an attempt to move ahead. 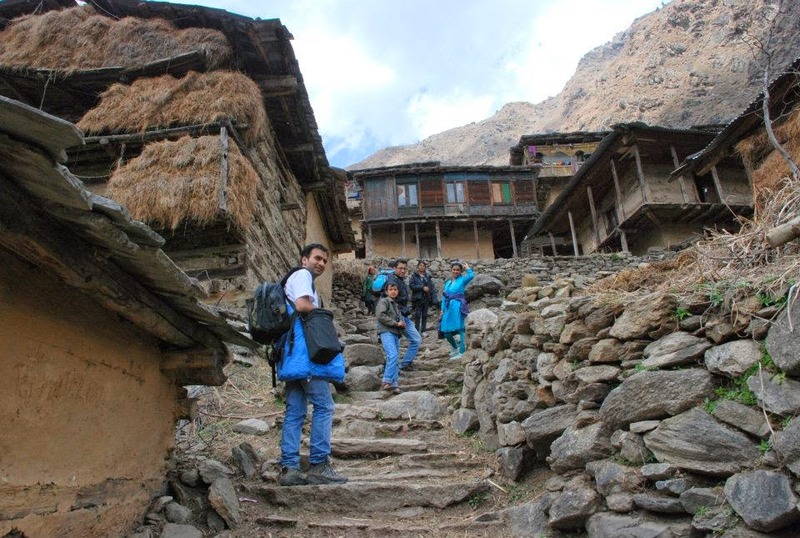 Although we did not complete the trek to Nadar but we stopped at the village Pekhli on the way. Interacting with the local people was very enlightening and we were told of interesting anecdotes as to how they keep sighting Cheer in their fields very often. Hearing their stories, I was feeling disappointed of not reaching Nadar. The Surprise find: Sensing my disappointment, Mr.Sood suggested that there is still time, and if I agree, we may all trek upto the entry gate of the GHNP and may get find something interesting on the way. We drove to Gusaini from where the trek to Rola starts. We started around 1 PM and reached the main gate at around 4 pm. We met Whiskered Yuhinas, Yellow-bellied fantails on the way. Not being able to capture them in the camera was disappointing. At this stage, little did I know that all my disappointment was going to vanish shortly. As we were trekking back to Gusaini, we heard the call of a Koklas from the next bend downhill. We immediately froze and waited for the Koklas to reveal its exact location. After almost 20 minutes of waiting, we could see a beautiful male perched on a big stone. I could manage a decent shot of the bird and was feeling elated at getting two of the the pheasants in two days. Evening was again spent on at the tirthan river such sitting and relaxing. 14th Morning: Morning is the time of maximum activities of birds. Just standing in the valley and watching the Asian Pradise Flycatchers flying from one tree, the white ribbon like tail undulating to the other was an unforgettable experience. There are at least five to six pairs within the small area of Nagini only. Getting these birds from close range is not easy and tirthan is an exception. After finishing business with APFC, I proceeded to the Forest Rest House. 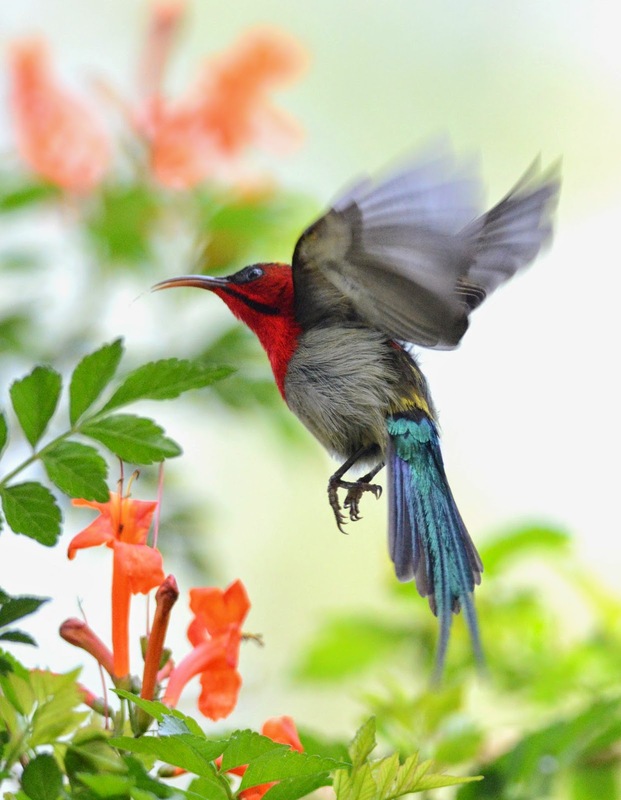 The target was to find the Crimson Sunbird. We reached the spot at around 8 AM and waited for the bird to arrive. It is such a joy to see this bird flitting from flower to flower doing all kinds of acrobatics. In the evening, we boarded the bus from Aut to reach delhi early morning at 6 AM.